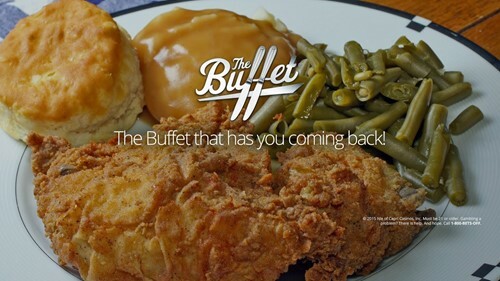 The The Buffet is a restaurant inside Lady Luck Casino - Marquette in Marquette, Iowa. If you've eaten here before why don't you tell us about it? Want your next dinner reservation comped? Become a URComped VIP (it's free). It is the responsibility of the hotel chain and/or the individual property/ restaurant to ensure the accuracy of the photos displayed. URComped is not responsible for any inaccuracies in the photos. Was under $12 with beverage. Pretty good with a variety of food. Had pork prime rib they called it. Was like pork tenderloin very tender. Awesome food and services ! It's a nice place to eat. Sometimes you have to wait forever to get a re feel on your drink. Their food and variety is absolutely outstanding. I have dined there on several occasions and never been disappointed. The prices are not too bad and the place is not overly crowded. Definitely a good place to try. Easy in, good food, splendid service. Want your next dinner reservation comped? Thank you for your feedback! We will review and make any necessary changes and we will get back to you ASAP!! !